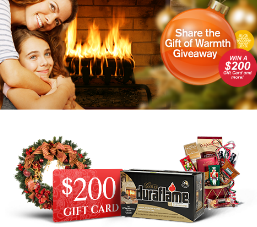 Duraflame Share the Gift of Warmth Sweepstakes – Win a $200 gift card & more for you and a friend! 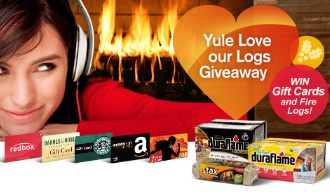 Win a $200 gift card, a holiday gift basket, a holiday wreath and one case of duraflame logs for yourself & a friend! SWEEPSTAKES PERIOD – Giveaway starts at 6 AM Pacific Standard Time (“PST”) on December, 1, 2014 and ends at 11:59 PM (“PST”)on December 14, 2014. PRIZES – The one (1) winner will receive one (1) $200 gift card, one (1) Holiday Gift Basket, one (1) Holiday Wreath, and one (1) case of duraflame® fire logs for themselves and, one (1) $200 gift card, one (1) Holiday Gift Basket, one (1) Holiday Wreath, and one (1) case of duraflame® fire logs for a friend. “Friend” is defined as someone NOT living in the same household as winner, is at least 18 years of age, and resides in the US.